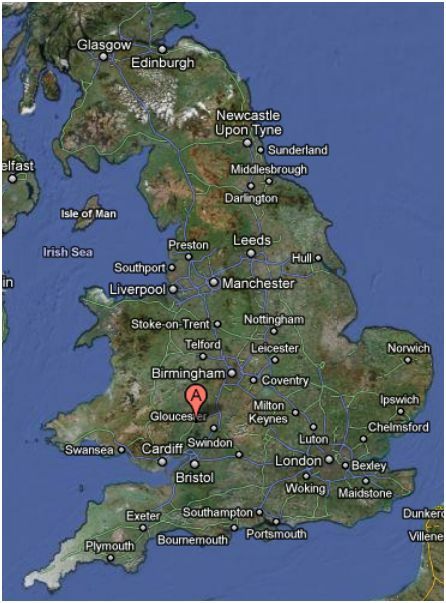 southern end of the Welsh border. Appeared in Adventure(s): The Boscombe Valley Mystery (BOSC). Holmes was called in by Lestrade. Lestrade was convinced the case against the defendant was solid, but Holmes was not so sure. It turned out, as you might expect, that Holmes was correct, and Lestrade was not. Holmes made an agreement with the killer that he would not turn him in unless someone else would be wrongly accused or convicted. But Holmes aided the defense attorney, and working together, their excellent work freed the innocent defendant. The real killer was an invalid with only a short time to live, and was a retired outlaw with lots of money which he had not acquired by means of honest toil. The murder victim was a blackmailer who gave the killer little choice in how to handle the matter. Neither was a fine fellow. way west. Holmes was wearing the soon-to-be-famous deerstalker cap, described by Doyle as a close-fitting cloth cap. 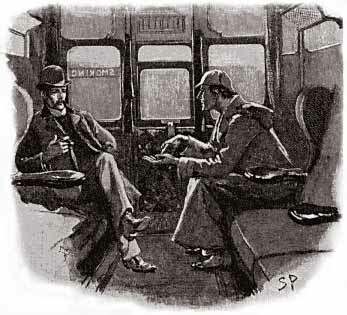 In a later story, Silver Blaze (SILV) the (almost) same illustration appears, and Doyle described Holmes as wearing his ear-flapped travelling-cap. The deerstalker and cape would never have been worn in town (London) but were suitable attire for the “country” which was the setting for both SILV and BOSC. For his assignment in Ross, Lestrade also wore non-citified attire. He was dressed “in a light brown dustcoat and leather leggings in deference to his rustic surroundings”. Lestrade’s status in this adventure is not clear to us. Lestrade was a Scotland Yard detective, and was sometimes assigned to out-of-town investigations when requested by the local constabulary. But it this case, Miss Turner retained Lestrade on behalf of the accused, to work out the case in his interest. We do not know if Lestrade was “moonlighting”, or if there was some arrangement in which a wealthy family could request or contract for the services of Scotland Yard. Lestrade contacted Holmes by wire and asked for assistance. Financial arrangements were not revealed to the reader. At length we have the satisfaction to record the opening of this line Railway, which took place on the 1st day of June last, with great rejoicings. On a Rocky eminence looking over the Wye stands the town of Ross. Nothing can be more picturesque than its position from the Railway. We should add that the opening of this line of railway gives the tourist cheap and easy access to the tour of one of the finest rivers in Europe. 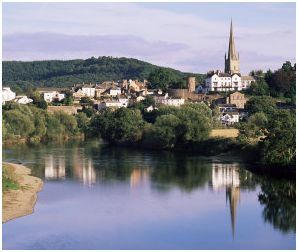 The Wye tour, considered not to be excelled by any in Switzerland, can, by means of this railway, be accomplished in less than two days; and, by an excursion-train of Great Western, there is not a mechanic in London who may not enjoy, at the cost of one day`s labour and three days` wages, a treat hitherto only within reach of the wealthy. Then, and now, the spire of the 700 year old church dominates the view of the town when it is approached from just about any direction. 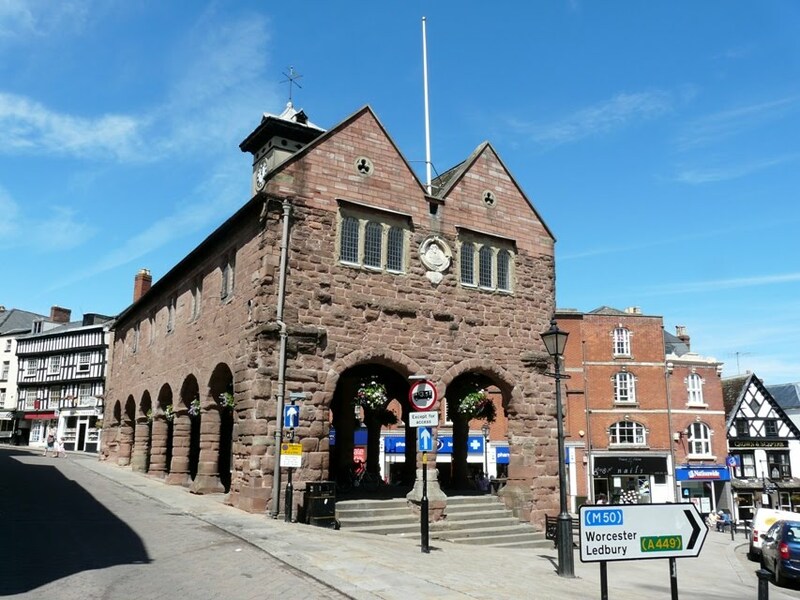 In addition to being home for the old market town of Ross, Herefordshire is an important agricultural area. 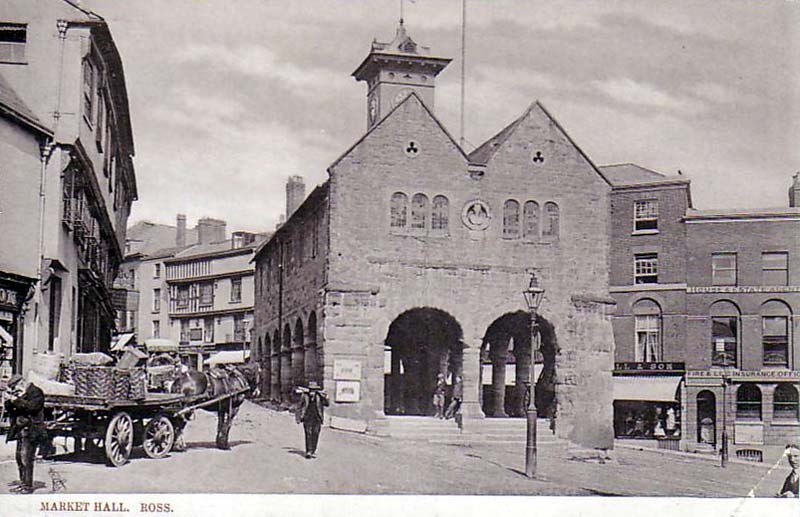 It is in Herefordshire that the white-faced Hereford line of cattle was bred and developed. Herefords are stocky and muscular, prevalent in the production of beef. 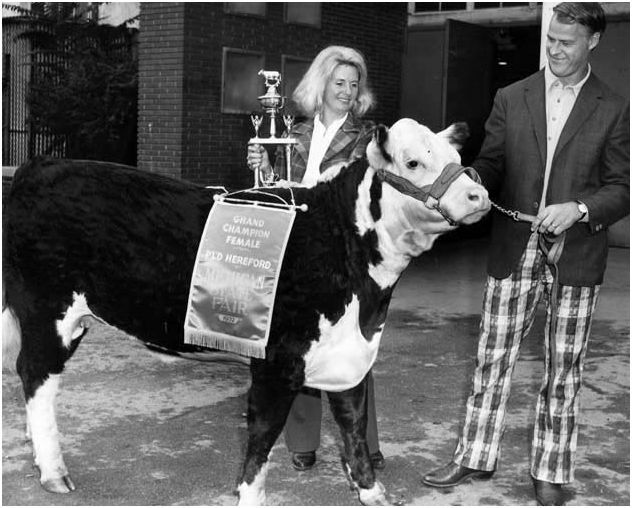 Here we have a picture of a prize-winning Hereford heifer (for you non-ag types, a heifer is an adolescent female). The one shown here is a polled Hereford, a variety that does not grow horns. And here is a bonus challenge for readers of McMurdo’s camp: Can you identify the gentleman with the garish trousers? He is a famous person, and in his field, one of the best-known in all of history. (He did not achieve fame and fortune breeding, raising, or displaying cattle.) If you wish to play Sherlock, there are clues in the photo. Remember, observation of trifles is the key. If you think you know the answer, please let us know in the comments, but do not give the actual answer. We will put a list of people who got it up on the site in a few weeks, assuming anyone is interested. Later: We did not get a lot of replies, and no correct ones. Anyway, at the bottom of this article is the answer, and the explanation of how Holmes would have gotten there. Finally, here is the telegram Holmes sent to Watson asking for his assistance in the case. 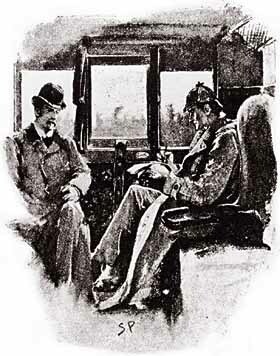 Holmes’ reference to air and scenery demonstrates the attributes of Ross that then and now make it a popular tourist destination were well-known to Sherlock Holmes. HAVE YOU A COUPLE OF DAYS TO SPARE? HAVE JUST BEEN WIRED FOR FROM THE WEST OF ENGLAND IN CONNECTION WITH THE BOSCOMBE VALLEY TRAGEDY. SHALL BE GLAD IF YOU WILL COME WITH ME. AIR AND SCENERY PERFECT. LEAVE PADDINGTON BY THE 11:15. Here we have a man of confidence and bearing. Obviously not a farm person, but a celebrity of sorts, given. Begin with an observation of the left hand. Not the delicate appendage of a musician, actor, politician, or an executive. A large strong-looking hand, accustomed to making its own way physically, over the course of a lifetime. Then the man himself. Large-framed, but no fat or fleshy looseness to him. Sloped shoulders and a strong neck. Muscular legs obvious inside the garish trousers. Lean, lithe, muscular, strong. Possibly an athlete? At least a strong balance of probability. Then the banner on the animal, barely discernible through the sheen. The date, 1972, agrees with the style of the trousers, which appear to be somewhat out-of-place on a man not accustomed to wearing the hippie-influenced attire of those times. The banner also says Michigan State Fair. State fairs are typically are held in late summer. What Michigan athletes are famous enough to be asked to pose for the fair, but are not busy in their sport? Eliminate football (training camp) and baseball (active season). Basketball? Timing is OK, but not the physical appearance of a basketball player. So what remains? Hockey, of course. A famous hockey player, civic minded enough to go along with the appearance at the state fair, but not in a station of life too high above that. The Michigan State Fair is held in Detroit, so he must be a member of the Detroit Red Wings. The answer? Mr. Hockey himself, Gordie Howe, one of the all-time greats.